Famous Fine Art appraiser Bert Dorpmans is the engine behind our passion for art at McMaster Gallery. 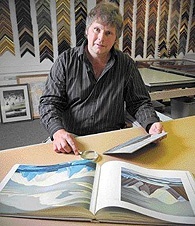 With over 35 years in the art field, Bert has acquired the eye for valuating art. He is responsible for finding art pieces fetching literally millions of dollars at auction, and there experiences have solidified his reputation in the appraisal field. At McMaster Gallery, we are always happy to take a look at your collection at no charge. After that, we will offer direction as to if a written insurance appraisal would be advisable, and/or directions to the next step if you would like to sell your pieces of art. We will help you get the most money for your artwork. McMaster Gallery provides documentation for the above, which includes item / artist description, auction records for the artist and a general assessment of authenticity (provenance), condition, quality and a current market value.